This is a high quality package with no surprises. Price is $1100. cash only. This is the industry standard for a high quality digital accordion; light weight, easy to use, and amazing features and versatility. 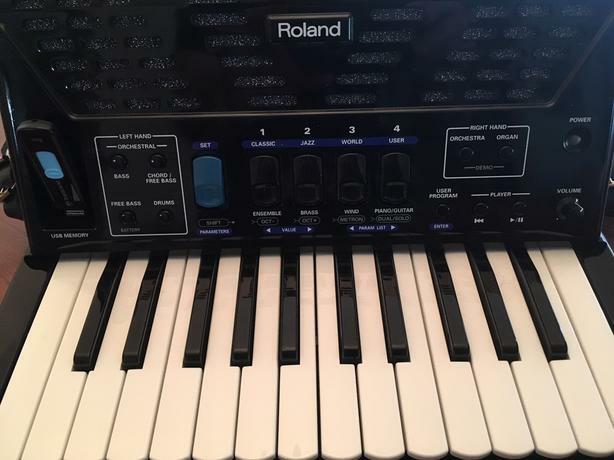 This (72 bass) accordion is in outstanding condition; it is being sold only because I have too many instruments and this excellent accordion should be used and played. It comes with a high end perfectly fitted soft shell case. Compact and Lightweight with Advanced Features V-Accordions have revolutionized the music world, and Roland has dedicated itself to the ongoing development of these amazing instruments. The FR-1x series is the newest addition to the famous V-Accordion family. These compact, lightweight models offer the same flexibility and portability as their popular FR-1 predecessors, but add significant features, including USB functionality and advanced bellows-pressure circuitry for enhanced sensitivity and precision. With new-generation speakers onboard and an expanded 7-segment/3-character display, the FR-1x piano-type set a powerful standard for a small lightweight accordion.